Chimpanzee Information: Have you ever heard of the Bili Ape? Bili Ape, also Bondo Mystery Ape, is the name given to a large primate that inhabits Bili Forest in the Democratic Republic of the Congo. A juvenile Bili ape in the Gangu Forest (photo by Cleve Hicks). March 26 - 29, 2001 -- Listen to Morning Edition, March 26, 2001, for the latest National Geographic Radio Expeditions based on NPR’s Alex Chadwick's visit to Central Congo and the search for the Bili ape. Researchers have long wondered about a large primate skull found a century ago in the northern Congo. Gorillas have never been reported in this region. But there are stories of very large apes -- and recent evidence suggests that something unknown may be there. Intrigued by the possible existence of a new species of ape -- news that would rock the world of science -- some of the most renowned ape researchers in the world agreed to undertake an expedition to the Bili forest. The area falls within the highly unstable Democratic republic of Congo, the former Zaire. Two rebel armies are fighting the central government in Kinshasa, and only a week before the expedition was scheduled to begin in January, Congo leader Laurent Kabila was assassinated. The Bili forest research site is hundreds of miles behind rebel lines; there is little civil authority; roads and communications are poor; there is no medical care. No scientists are known to have explored the area. Day One - Listen as Radio Expeditions begins the search for the Bili Ape at a dirt airstrip in Arua, Uganda, where a small plane is refueling before flying on to the Congo. On board are two scientists -- Dr. Richard Wrangham of Harvard University and the Leakey Foundation, and Dr. Christophe Boesch of the Max Planck Institute for Evolutionary Anthropology in Leipzig. Wrangham and Boesch explain both their interest in and skepticism about the puzzling reports from Bili. The two scientists are skilled explorers with many years experience studying and following chimpanzees in the wild. They will need those skills in the days ahead, when they will camp in the forest with the Radio Expeditions team, trying to locate the elusive Bili Ape. Day Two -- On a rutted road through the Congo forest, Radio Expeditions stops with the researchers to ask local villagers about the Bili apes. They say they know about a large ape, but pictures of gorillas don’t look familiar to them. It's a clue that perhaps the animal we’re looking for is either a large chimpanzee or possibly a new species. Listen as NPR's Alex Chadwick talks to expedition leader Karl Amman about some of the evidence that’s lured the biologists here -- including a plaster cast made near here a few weeks ago of a very large ape footprint. These are the forests of old Africa and there are things in them that are still unknown. Day Three -- Listen as Alex follows two other scientists into the forest -- Esteban Sarmiento of the American Museum of Natural History and George Schaller of the Wildlife Conservation Society. In a day of exploring, we find a nest that may suggest the presence of gorillas, but other evidence that leans toward chimps. We also find lion tracks, ape feeding sites, and a forest of sights and sounds that are thrilling even without a mysterious ape. Day Four -- Listen as Alex joins Christophe Boesch on an early morning trek to a distant forest site to try to find chimps. Boesch explains his technique for locating the animals and the very real crisis that confronts apes in the wild everywhere: Their homeland is being turned into farm tracts and they are being hunted for food. Ape numbers are in sharp decline, and scientists are trying to find new populations that can be protected. Richard Wrangham introduces us to an investigative technique that is -- challenging. We wash ape feces to learn what the animals eat. Wrangham is able to conclude that the Bili ape is not a gorilla, but rather a chimp. Karl Amman plans to keep trackers in the forest to continue looking for the elusive animals that he still believes may be a new chimp. But the other scientists agree with Wrangham that the Bili ape is in all likelihood a chimpanzee. Says Christophe Boesch, that is enough. For us, the chimp is still a mystery. Until very recently the possibility of an unknown form of great ape existing in some remote region of darkest Africa, yet still eluding scientific recognition, seemed ludicrous — but not any more. Thanks to some extraordinary discoveries, this remarkable prospect may soon be formally confirmed. Indeed, in stark (but also much-welcomed) contrast to the all-too-familiar cryptozoological scenario whereby reports of a mysterious creature are followed by searches that singularly fail to obtain tangible proof of its existence, the evidence collected in support of the Bali ape's reality is so plentiful and diverse as to be positively embarrassing — bearing in mind that its identity has still not been resolved. This curious saga began over a century ago, when, in 1898, a Belgian army officer returned home from what is now the Democratic Republic of Congo with some gorilla skulls he had obtained near the village of Bili, on the Uele River in northern Congo's Bondo area — even though no other gorillas had been found within hundreds of miles of Bili before (or since). He donated them to Belgium's Congo Museum in Tervueren, where in due course they were examined by its curator, Henri Schouteden. He was sufficiently struck by their anatomical differences from other gorilla skulls as well as by their unique provenance (roughly halfway between the extreme edges of the western and eastern distribution of any gorilla populations) to classify them as a new subspecies of gorilla, which he dubbed Gorilla gorilla uellensis. The video footage appears to show a female "mystery ape" with a baby.Less convinced of their separate taxonomic status was mammalogist Dr Colin Groves, whose examination of these skulls in 1970 led him to announce that they were indistinguishable from western lowland gorillas. Thereafter, the Bili ape sank back into obscurity — until 1996, when Kenyan-based conservationist and wildlife photographer Karl Ammann, intrigued by its strange history and apparent disappearance, set out on the first of several Congolese quests to rediscover this mysterious primate. And rediscover it he did, bringing back such compelling evidence for its presence that several other notable investigators launched their own searches, and returned with equally fascinating clues concerning the Bili ape's nature. Such researchers included primatologist Dr Shelly Williams from Maryland's Jane Goodall Institute, Dr Richard Wrangham from the Leakey Foundation, Dr Christophe Boesch frem Leipzig's Max Planck Institute for Evolutionary Anthropology, Dr Esteban Sarmiento from New York's American Museum of Natural History and Dr George Schaller from New York's Wildlife Conservation Society. Large and elaborate ground nests located in riverbeds are only found north of the Uele River.What makes their various finds so especially interesting is the ambivalent identity that they collectively yield for the Bili ape — because, uniquely, it deftly yet bemusingly combines characteristics of gorillas with those of chimpanzees, creating a shadowy anthropoid that is at once both yet neither. For instance: if the Bili ape is a chimpanzee, it is a veritable giant, because videos of living specimens and photographs of dead ones suggest a height of 5-6ft (1.5-1.8m) — a mighty stature supported by the discovery of enormous footprints, some measuring almost l4in (36cm) long, and therefore nearly 2in (5cm) longer even than those of the mountain gorilla! Also, very large ground nests constructed by Bili apes have been found that compare with those created by gorillas; normal chimps build smaller, tree-borne nests. Further evidence of the Bili ape's great size comes from local Bondo hunters, who distinguish two distinct apes — 'tree-beaters' (normal chimps) and 'lion-killers' (the Bili apes). The latter earn their name from their combined size and ferocity, a mix potent enough to ensure their terrestrial safety even in a jungle profusely populated by lions and leopards. Indeed, so unafraid of these great cats are the Bili apes that they hoot loudly when the moon rises and sets — an activity unknown among normal, smaller chimps, which avoid doing so in case they attract predators. Equally noteworthy is the presence of a pronounced sagittal crest running along the top of one of the original skulls collected by the Belgian army officer and also on a Bili ape skull found by Ammann in 1996 — because this crest, normally an indication of powerful jaws as the jaw muscles are attached to it, is characteristic of gorillas, not of chimps. Conversely, the facial anatomy of the Bili skulls is decidedly chimp-like, not gorilla-like. 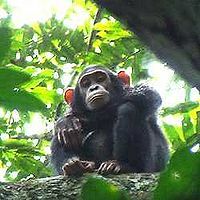 In addition, hair samples taken from Bili ape ground nests have been shown to contain mitochondrial DNA similar to that of chimps, and the fruit-rich contents of examined faecal droppings is again consistent with a chimp identity although, perplexingly, the droppings themselves outwardly resemble those of gorillas. Karl Ammann found this crested skull during his initial survey in 1996. The sagittal crest is not normally seen in chimpanzees but is characteristic of the male gorilla.So what is the Bili ape — a gorilla-sized chimp (freak population?/new subspecies?/new species? ), an aberrant form of gorilla (freak population?/new subspecies?/new species?) that has evolved certain chimp-like anatomical and behavioural characteristics, or even possibly a genuine chimpanzee-gorilla hybrid? No confirmed crossbreed of chimp and gorilla has ever been recorded, but the two species are sufficiently similar genetically to engender viable offspring. Mitochondrial DNA is passed down exclusively from the maternal parent, so if such interspecific matings are indeed occurring, they must involve female chimps and male gorillas, to explain why the mitochondrial DNA from the Bili ape samples is chimp-like. Happily, however the mystery of the Bili ape's identity may soon be a mystery no longer. Since autumn 2003, full DNA analyses, including nuclear DNA (that will shed light on both the maternal and the paternal lineages of the Bili ape), have been taking place at Omaha's Henry Doorly Zoo, under the auspices of conservation geneticist Dr Ed Louis, and involving DNA comparisons with gorillas, chimps, and also bonobos (pygmy chimps). Ultimately, however a body, or at least some tissue and blood samples, will be needed for absolute verification of the Bili ape's true nature. Until then, the primate world waits, and wonders, and the Bili ape continues to haunt the Congo's Bondo rainforests, cheerfully oblivious to the stunning fact that it may yet be unmasked as the most sensational zoological discovery of the past hundred years. Not so silly in Bili after all. From: Fortean Times [FT187], September 2004. 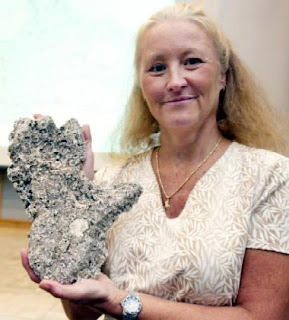 Shelly Williams, 49, the world-renowned primatologist credited with gathering convincing evidence of a new species of great apes, a cryptid primate known to cryptozoologists as the Bili or Bondo ape, was shot in the back around 2:30 pm, on November 7, 2005. She apparently was the innocent victim of an unrelated drug shooting in Smyrna, Georgia. Williams remained in critical condition in intensive care at Atlanta Medical Center. The bullet, which passed through her spinal cord, grazed the nerve before glancing off her liver and lodging in her diaphragm. While police have some leads, no arrests had been made. The Atlanta Journal Constitution reported that "Williams is credited as the first scientist to identify a previously unknown group of large apes in the jungles of Central Africa. The animals, with characteristics of both gorillas and chimpanzees, were sighted by Williams in 2002 in the northern Democratic Republic of Congo." A report about Williams’ discovery of the mysterious cryptids published in 2004 in the British magazine New Scientist said that if the apes are confirmed to be a new species of primate, it could be "one of the most important wildlife discoveries in decades." Her discovery was reported as one of the top stories in cryptozoology for 2004. Williams captured the previously unknown apes on video during a visit to the Congo in 2002. She described her encounter with them in the New Scientist article. "Four suddenly came rushing out of the bush towards me," she told the magazine. "If this had been a bluff charge, they would have been screaming to intimidate us. These guys were quiet. And they were huge. They were coming in for the kill. I was directly in front of them, and as soon as they saw my face, they stopped and disappeared." In a January article in Time magazine, Williams defended her discovery against scientific critics who have discounted her methods. "The unique characteristics they exhibit just don’t fit into the other groups of great apes," she told Time. The primates could be a new species, a new subspecies of chimpanzee or a hybrid of chimpanzee and gorilla, she said. "At the very least, we have a unique, isolated chimp culture that’s unlike any that’s been studied," she said.